French Emblems: Emblem: Celeritatem mora, & haec illamvicissim temperet. Quid scamno reses, obtendis testudinem & alas? Humum hinc premis vestigio, calce hinc caelum appetis? Celer nimis, velocitate tempera moram. Why are you sitting on a stool, holding out a tortoise and a pair of wings? Why do you press your footstep on the ground with one foot, and raise your ankle to the sky with the other? Apply moderation in all things, take your time; if you are too much in a hurry, mix speed and delay in due proportion. vel tardi, vel praecipitis nomen incurras. A hexameter, to which is added a ‘Lame’ tetrameter, also called Episcazon [lame] by Plotius, while Servius calls it ‘Aristophanean’. 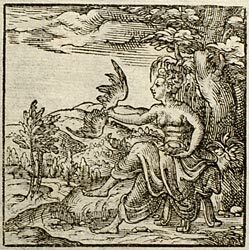 A woman is depicted sitting on a footstool or three-legged stool, holding in her right hand two wings at full stretch, in the manner of the winged sandals of Mercury, as if they were her own property, prepared for flight; in her left she holds a tortoise, deservedly called ‘slow-stepping’ by Pacuvius. Again, with her right foot she treads on the ground, but her left is raised high, so as to show the weightiness of her right foot holding back the impetuous speediness of her right hand, and likewise the swiftness of her left foot helps the tardiness of her left hand. [p.121] The emblem points to a golden mean, and similarly to a moderation of the soul: that we should not get carried away to such an extent that we should become forgetful of our lot, nor, in the words of the proverb, run too fast to see a hiding-place. It is related to that saying of Augustus: ‘Make haste slowly’. Excessive slowness comes to be criticised by haste; and too much speed is not to be praised, and is a fault. Therefore a sense of moderation should be preserved in everything: and you should make speed in such a way that you meet neither with a reputation for tardiness nor for haste. 1. For Plotius see emblem X ([FJUb010]), for Servius, emblem VI ([FJUb006]). 2. Marcus Pacuvius, Roman tragic poet, 2nd century BC. the word ‘tardigradus’ is quoted by Cicero, De Divinatione ad M. Brutum, 2.64.133. 3. The phrase ‘auream mediocritatem’ is Horace’s: Odes, 2.10.5. 4. A proverb referring to a game of hide-and-seek (lit. ‘run so, that [you run] beyond the house’); slightly misquoted from Terence, Phormio, 5.2.3.